If you've lived in Minnesota for any length of time you'll probably agree that January and February are the toughest months to get through. In a typical winter the majority of these months have high temps of below freezing and it's pretty easy to spend all your time indoors. It's also easy to go weeks without seeing the sun. This winter has been really different from that however and the sun has been shining nearly every weekend. Though the temperature today was cold at just 10 degrees, it is still great walking weather -especially without the snowy, icy paths like last year. The first thing of interest I spotted was near the northwest corner of the park where hundreds of European Starling decided to park and make a lot of noise. After a while one or two would dart off, tempting the others to do the same and the whole flock would move to a different tree for no apparent reason. Then it would happen all over again in another few minutes. If you ever see this many Starlings at once, make sure to listen to the noises they make. You can often hear imitations of other birds such as Hawks or Blue Jays coming from the group. Later I spotted some Downy Woodpeckers but things were generally quiet after passing the Starlings. When going around the southeast baseball diamonds, a few Crows were scattered around not to high up in some scrubby trees. One was obviously busy with something so I was able to get closer and catch this shot showing a mouse in his beak. It's easy to overlook how resourceful Crows are. If you think about how big they are and how large in numbers they are, you gotta wonder how are all of them are surviving each day. In order to make it, they can't be too picky about what they eat. Today felt just a tad bit more like a normal January day with some snow on the ground and a temperature of around 20 degrees. There was a stiff breeze leftover from yesterday and I my normal winter wear was actually appropriate today. By the time I'd gotten to the north side I hadn't seen a thing yet, so I paused for a while hoping to see something. As I scanned the field, I spotted 2 barely noticeable dark spots among the cattails. Upon closer look with my binoculars I realized they were Deer ears. Then to the left was another pair. These were the first Deer I'd seen in quite a while but they were quite content to be laying down and hiding out. I saw a large variety of wildlife today but didn't get to photograph everything. Here is my total list for the day; Deer, Mice, European Starling, Robin, Canada Geese, Crow, Dark-eyed Junco, Cardinal, Chickadee, Mourning Dove, Downy Woodpecker, Hairy Woodpecker, Red-tailed Hawk and Northern Shrike. Of all the birds I spotted today, the one I least expected were the Mourning Doves. Though I think they can be found in the lower portion of the state all year, they're not necessarily in my list of common "winter birds" -at least at Palmer Lake anyway. I heard them fluttering upwards when I walked into the woods on the northeast side. There were at least 20 or more and this particular one presented me with a good photo opportunity. Later on the south side after crossing over the creek again, I heard a faint chirping call that I come to associate now with a Northern Shrike. I could hear it but couldn't place a visual for the longest time and started to think I was wrong in my assessment. But then he popped out of some thicker trees and into my field of view. Distance-wise this is probably the closest I've ever come to a Northern Shrike, but my view wasn't the greatest. I inched even closer but had to stop whenever I could pull off a photo through a small opening in the trees. In this picture I finally managed to capture the hooked beak that the Shrike uses to capture and rip apart it's prey, which can include insect, rodents and other birds. Apparently Chickadees are on the menu of the Northern Shrikes at Palmer Lake Park! This winter has got to be the strangest I've experienced in my 30-some years of living in Minnesota. While January temperatures even in the 20s are generally considered mild by most Minnesotans, a good deal of this month has been in the 30s and sometimes in the 40s! Today however was much more in line with a typical January day at -5 degrees --and even that's not bad to be honest. The low temps must have been a bit of a shock to wildlife as well as there was just nothing moving around today. 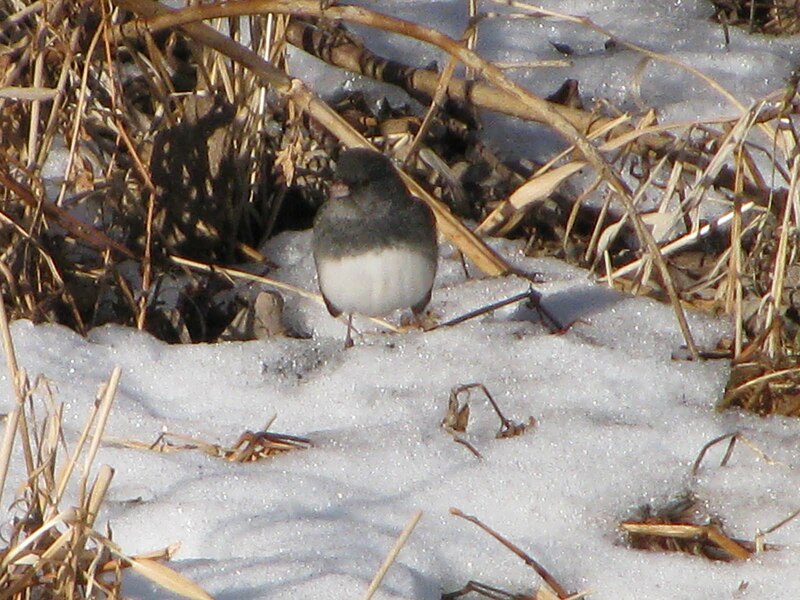 I saw only a few birds overall and the only one I managed to get a photo of was this Junco. Later as I came around the pond on the southwest side where the Ducks usually hang out, the open water was steaming up and creating a haze. The water was clearly warmer than the air temperature and the freezing moisture was coating the banks of the pond in a coat of icy frosting. I had an extra day off from work today for MLK Day so I visited the park just after 11am. It was colder than yesterday at around 27 degrees. After hearing reports of attempted vehicle thefts at my normal parking spot, I've changed to parking on the east side now. Going in my usual clockwise direction, I see the whole south end of the park first now. Only minutes after leaving my vehicle I was passing by the small pond south of the baseball diamonds and was amazed to see a critter pop his head out of a small hole in the ice near the shoreline. I was within mere feet when I spotted this protruding face and I hadn't even taken my camera out of the case yet! The animal saw me pretty quickly as well and darted back under. It's quick behavior, shape and color told me that it was a Mink and I was shocked to have gotten this close to one. I though to myself I'll never have a better photo opportunity of one so I decided to sit there and wait for him to reappear. I had to explain to a lot of passersby why I was standing there staring down at a frozen pond. 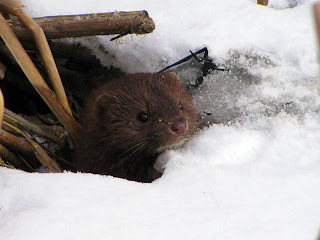 I even told a few people what I had just seen and they looked at me kind of strange -either not knowing what a Mink was, or disbelieving that one would be in a city park. After about 20 minutes I was ready to give up and then he popped his head out once more. This time he didn't come out as far and kind of rested his head on the snow for a second. I slowly moved up my camera, took one shot and then he was gone again. It was one of only 7 photos I took during my entire walk -and quite a lucky one at that! Following yesterday's cold temperature of just 10 degrees, today was above average at 34 degrees! On top of that it was clear, blue sky and it again feels more like early spring than mid January. I walked in the opposite direction today which proved to be a mistake as the sun was glaring my eyes the entire way and I had a hard time seeing anything. Despite that I did manage to spot a few interesting birds. The first was this House Sparrow on the east side near the baseball diamonds. I haven't been seeing a lot of them, though they are a common bird even through the winter. When I got home and looked at the photo closer, I noticed the green buds on the tree! Not sure if that is normal or if it's due to our unusually warm winter. Later I came across a small group of Starlings, probably less than 10 altogether. They were high up in some tall trees probably enjoying the sun. Though considered a kind of "nuisance" bird, I'm still intrigued by the wide range of sounds they can make. 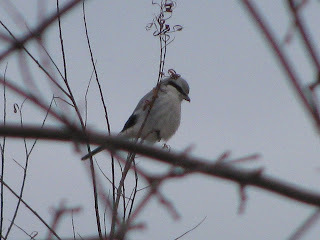 Near the end of my walk on the south side, I heard a bird that has become almost common to me now -a Northern Shrike. I first thought he was out in the cattails again but then I spotted him moving back and forth between some scrubby brush just above the cattails. I am going to have to tally up my Shrike sightings for this season just to see what it comes to. It seems like I am seeing them nearly every visit lately! This Saturday was only 10º when I arrived at the park around 10am. It seemed like a bit of a shock to nature as well as there wasn't much of anything happening. Though I know there are still Deer left after the special hunt this fall, I've not seen one for quite some time. Though cold today, it's not been cold for long enough to freeze all the water. Between the two furthest east bodies of water is "kind of" a creek that flows just enough to help keep it from freezing quickly. Here the Robins have taken up residence in much larger numbers this year versus last. Occasionally they will drop down to the water's edge for a drink or sometimes a quick bath. I'm still seeing a good variety of the "normal" winter birds including Chickadees, Juncos, Nuthatches and Starlings, although the Cardinals seem to be sparse as of late. Also seeing a good variety of Woodpeckers including Downy, Hairy (pictured), Red-bellied and even a nice big Pileated today. I heard the Pileated in the woods and went in closer for a photo but didn't manage to get one. As he flew off he had his back to me and I was able to see a quick flash of white strips on his wings. 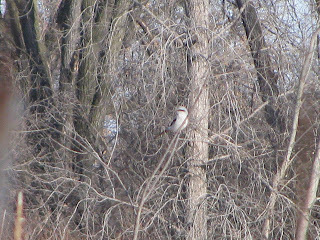 Only about a year ago, I considered my first Northern Shrike sighting a major achievement in my new found hobby of "birding." Those first few sightings, in dim snowy conditions and from long distances now pale in comparison to my experiences with Shrikes as of late. For a January day it was unbelievably warm and sunny today at 36 degrees. It was so nice that I just stood for a while in my favorite place in the park, where Shingle Creek flows back out of Palmer Lake. It was here that I noticed the Northern Shrike again in the same place -the same tree to be exact- where I'd seen him on the day after Christmas. With the creek separating us, he had no cause for alarm and just sat there for a long time singing out some beautiful songs more reminiscent of a Warbler. After a long while he changed perches a few times and then finally flew out into the cattails. 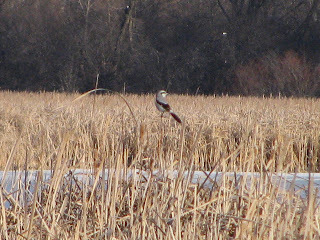 True to form, he seemed to select only the tallest available cattail to perch upon and I was able to keep sight of him in this new and unfamiliar territory. 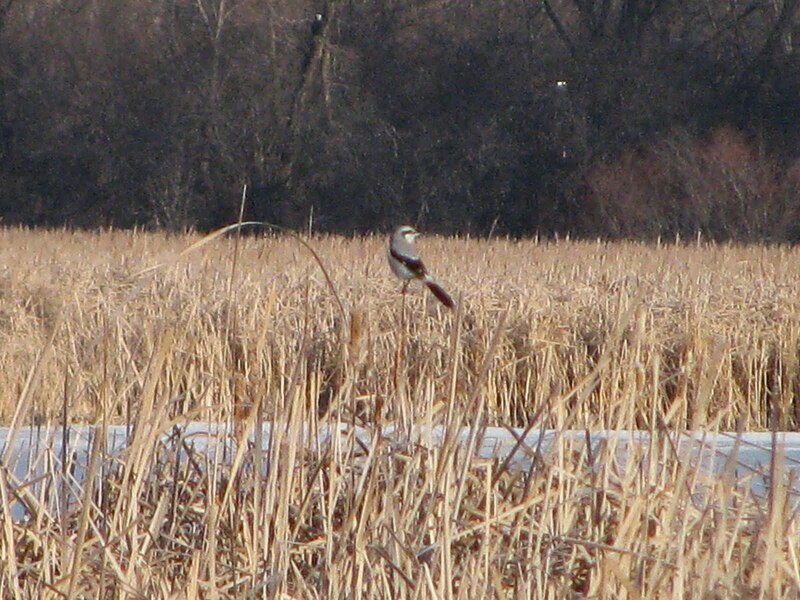 He then disappeared down into the cattails but surprisingly came right back up to perch on another tall cattail stem. This was repeated a few times and I was hoping to see him come up with something in his beak but neither he or I were so lucky. The warm temps and sunny skies always seem to bring out the birds and later I spotted a small flock of Dark-eyed Juncos. This was on the north end where a few houses meet the boundries of the park. There are a bunch of thick shrubs and trees here that the Juncos seem to like. But more often than not I tend to see Juncos on the ground. They are apparently looking for seeds of common weed plants. Today I also spotted Cardinals, Chickadees, Starlings and Hairy Woodpeckers. I watched a Cardinal, then a Chickadee bathe themselves in the exact same part of Shingle Creek, one right after the other. The change in weather we experienced last weekend around the New Year has come and gone. Temperatures are once again above average and the little snow we received has melted away. On almost every walk lately I seem to get only a 1/4 of the way around before I realized I've dressed too warmly. About this time today is when I glanced upwards and spotted a Northern Shrike high up in a tall tree. This was on the southwest side right near the water way that connects the two most western bodies of water. 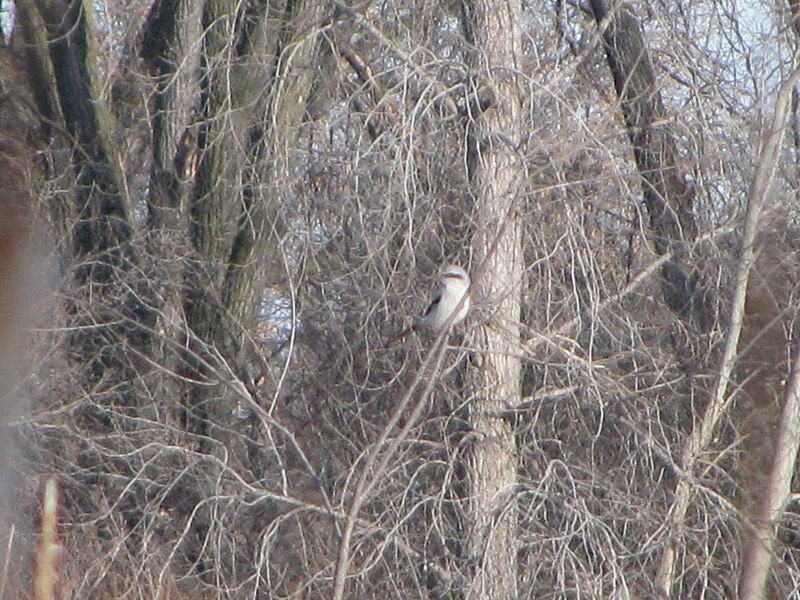 I would have never expected to see a Shrike here and I'm amazed at how often I am seeing them this winter! A bit later I noticed something that I just had to take a picture of as it really shows what this winter has been like. Patches of green foliage line the same wood chip trail on the southwest side. A few years back I remember being amazed to see some green leaves in December but this takes the cake. In fact it looked like they might still be growing without the weight of any snow on top. Later I spotted a nice Red-tailed Hawk perched above the baseball diamonds on the west side but was unable to get a decent photo before he took off. At the bridge over Shingle Creek I paused to watched some Mallards walking around on the thin ice that is barely distinguishable from the unfrozen water. It looked almost as though they were walking on the water. New Year's Eve this year came with a coating a icy, wet snow followed by wind gusts of up to 50mph, then by frigid temperatures in the teens. I actually opted not to visit the park yesterday as the winds were just brutal. By day 2 of the new year it was slightly more tolerable, though I waited until almost 3:45pm for the temperature to warm up a bit. I guess I'm spoiled by all those warm temps we've had until now. I walked opposite my normal direction today and didn't see much of anything until later on when I caught a glimpse of a large Owl dart out of the trees in front of me. It was getting dark already and I barely caught where he landed again. I took a quick look through my binoculars and was happily surprised to see a Barred Owl! I decided to walk through the woods a bit to try and get closer but I quickly scared him away due to my loud steps on the crunchy frozen snow. Along the way I stumbled upon a curious sight. Among the Buckthorn trees were hundreds of these tiny, bulbous "icicles" -only they were sticking upwards from the branches, not down. They immediately reminded me of a diamond on a ring. I imagine that they were formed by water dripping from above to create what I will now refer to as "ice diamonds." Shortly after admiring them I caught another glimpse of the Barred Owl as he selected another spot in the dimming woods. It is a terrible photo but sadly the best one I got. I've not seen one for so long and I'm glad to know they are still visiting Palmer Lake. As I made my way back to the parking lot, the sky was setting up a spectacular winter sunset that seemed to change every minute or so. The horizon line glowed a luminous red while the purple clouds above appeared to be dropping whisping waves of moisture below. It kept changing all the way until I got to my vehicle and was also being admired by other park goers. A nice sunset is always the best way to end my walk in the park!